Snowmen are a winter project that we can use before Christmas, during the Christmas season and even for a time after Christmas. So if you are very limited in time, snowmen are the way to go. The pattern for this can be printed on white paper and then just colored if you want to make a short project of it. Or there are also patterns for the vest, hat and pockets that can be printed on colored papers and used instead. The body pattern is in two pieces that need to be printed, overlapped where they match, taped and then copied. This snowman is finished on both sides. The finished length is 16 1/2″ and is easy enough for any class. Find “Twiggy, the Snowman” in the Christmas Projects Gallery in the sidebar. Click the photo for a full length view. 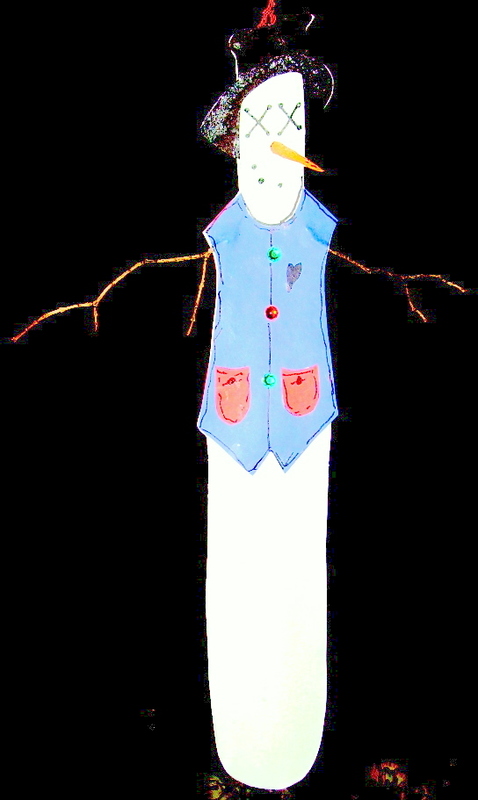 This entry was posted in Christmas Projects and tagged christmas crafts, christmas crafts for kids, christmas projects for kids, easy snowman projects, hanging snowman, snowman made with twig arms, twiggy the snowman, twigs. Bookmark the permalink.